Don't forget your helmet, Terry! Like everything I’ve ever read or heard in the sports media about quarterbacks and the Wonderlic test, it rehearses the standard examples of what seems to be an imperfect or weak correlation between being a good quarterback and being smart in an IQy-logical-problem-solving sense of “smart.” We have somewhat sketchy data on various quarterbacks’ test scores, and it easy for any journalist to point out some good QBs with low scores, and some mediocre QB’s with great scores. Bradshaw had the last laugh. 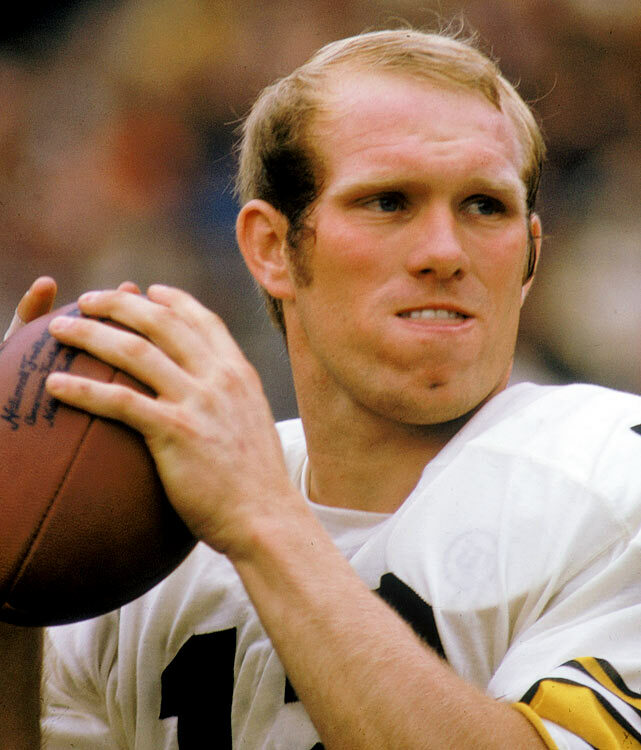 Bradshaw threw four TD passes and won Super Bowl MVP honors as his Steelers outgunned Henderson’s Cowboys, 35-31. That’s about it. Once again, we learn that the ranking of the most-to-least successful recent QBs does not look exactly like the ranking of the highest-to-lowest scoring on the Wonderlic. Of course, it should not be surprising that having a high IQ is not sufficient for being a great quarterback. How many TD’s did Einstein throw in college? Top quarterbacks require so many different mental, physical, and emotional skills — not to mention a good O-line, good receivers, and good coaches — that at any given moment in time there seem to be fewer than a dozen guys in the whole world who are capable of playing the position well. The only interesting question is why some people who are relatively thick in terms of traditional measures for IQ reveal themselves to be quick-thinking and intelligent while making decisions and calculations in the heat of battle on the football field. How could Brett Favre, Dan Marino, and Terry Bradshaw have been among the very most successful QB’s of all time? In the previous post I suggested that it is because our IQ tests have traditionally measured a relatively narrow range of cognitive skills (logic, problem-solving) and that a lot of heavy and fast brain processing required for decision-making does not even involve the parts of the brain that do the IQ-friendly reasoning. In other words, Favre, Marino, and Bradshaw really are smart. Their brains can process some kinds of information more quickly and accurately than you can, or than many brainiac QBs who are good at math can. It’s the tests and testers who are dumb. My advice to sports journalists scratching their heads over the Wonderlic: pick up the phone and call any professor at your local university who specializes in neuropsychology. Talk to him or her for half an hour, and you’ll be able to pound out the most interesting thing on this issue that has ever been written for sports fans. Those neuropsychologists know a lot more about intelligence now than Eldon Wonderlic did in the 1930s. Maybe they aren’t smarter that Eldon, and few of them have as cool a name, but they do have fMRI scanners now. So they can literally peer into people’s brains while they are making decisions. If you find talking to neuropsychologists intimidating, you might find all you need by downloading a copy of Jonah Lehrer’s How We Decide to your Kindle or smartphone. Nice post. My name is Luis DeLoureiro and I wrote the Wonderlic piece you reference in this post. To me, the Wonderlic is an input that should be considered – but, of course never by itself. I had a theory that it may be an indicator of players who outperform their draft status…..I think I found some correlation (as the article indicates with Fitzpatrick, Brady and Romo) but I was careful to point out that Garrard, Feeley and Derek Anderson outperformed their draft status despite lower scores. Guys like Marino and Kelly had enough physical tools (and, for lack of a better term, football smarts) to overcome a low Wonderlic. I think that will often be the case with first round picks…..they have the (perceived) tools, so you’re not trying to tease out some little tidbit that suggests they will be better than the tape and the other measurables would suggest. (Manning scored in the mid-20s and he appears to be a brilliant player). On the bright side, Ryan Fitzpatrick also scored a 48 and he did OK last season. Granted, it’s taken him a while to get a shot.